Any plans this weekend? 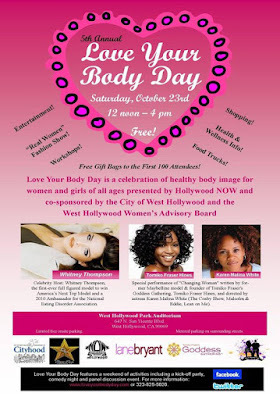 Well if you're free, go check out this exciting LA event going on Friday through Sunday promoting healthy female body images. Plus-size model winner of ANTM Whitney Thompson (seen above with plus-size model Chenese Lewis) will be there as well as other special guest appearances. The first 100 attendees will receive gift bags at Saturday's fashion show featuring clothes from F21+, Macy's, Anna Scholz, and more. For additional information about the Love Your Body Day campaign, click here. 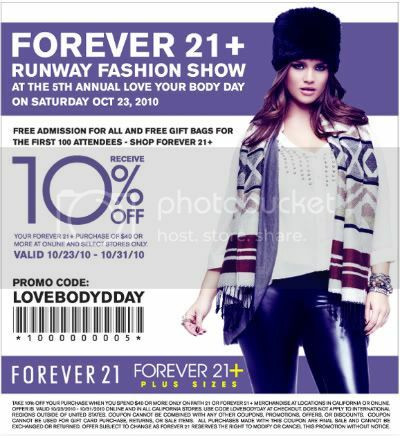 If you can't make it (like me), you can still enjoy this awesome coupon code for 10% off your F21 online purchase of $40 or more. Sweet!